Remove FRP and Google Account Bypass on Samsung Galaxy Grand Prime Plus. Remove FRP Samsung Galaxy Grand Prime Plus. FRP or factory reset protections is a standard security protections for the latest Samsung device released after the year 2016. It will help you to protect your Samsung device and information, including screen lock and data encryption. This security feature work on Samsung device run on Lollipop 5.1 OS or higher. When you set up Google account on your Samsung device it will automatically activate FRP on this device. Factory reset protection will protect your Samsung device from unauthorized user to use your device after factory data reset or master reset. The user must enter a correct Google account information previously synced on this device. So. without this Google account information we can't use this Android Samsung phone. So, how we can access phone menu and use this phone after perform hard reset? the following guide will help you to solve your problem. But, this guide only for Samsung Galaxy Grand Prime Plus owner only, not for a thief who stolen Samsung device. Tips: For the Samsung Galaxy Grand Prime Plus user, please remember or write down your Google account information (user and password) before performing hard reset or master reset on your Samsung device. Because you will need this information to log in to your Samsung device at the end of the hard reset process. What will you do if you forgot your Google account information (username and password)? 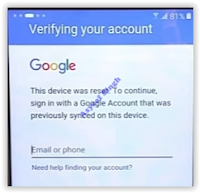 Please remove your Google account from your device first. Disable your security screen lock pattern or password. If you still want to remove your Google account, now you can follow this guide below. Remove FRP Samsung Galaxy Grand Prime Plus. When FRP enabling on your device and you're at the end of hard reset process, you will be stuck at verifying your account login screen as shown below. Now, you must have these tools to continue to remove FRP on Samsung Galaxy Grand Prime Plus. Once all required file successfully downl04aded on your computer now connect your phone to the computer via USB cable, we recommend using an original USB cable. Now install RealTerm on your computer, once it successfully installed run this program as Administrator. Then, Open device manager on your PC. Click your modem properties to see a port number (ex. port 3). Now, go to the RealTerm window again. click Port tab - then enter the port number (refer to step 4 above) - Then click change button. Now, write down or copy these commands at the notepad. Now, copy and paste 1st command at this form shown at the image below. Now you can go to your Samsung Galaxy Grand Prime Plus, your phone will calling 123 number. Now, release USB cable and tap reject. You will see google.com appear on the message box as a link. Just tap this link and your phone will launch a browser to open google.com. Just ignore to open google.com, and now type the following address at the address bar to open Google account manager. Then type this address again to open and d0wnl04d quick shortcut maker. Now, download and install ES file explorer apk. Once ES file explorer successfully installed on your phone, now go to download folder. There you must have two files. First, you need to install a Google account manager. Second, install a quick shortcut manager. At the result, you can tap Google Account Manager - Type Email and password. Finish, now you can use your phone without entering previously google account synced to this device. 0 Response to "Remove FRP and Google Account Bypass on Samsung Galaxy Grand Prime Plus"